Slouched at home on the living room sofa, I can remember hearing the song for the first time on MTV. By the end of the opening line – “What’s wrong with the world, Mama?” – I had already decided to buy the single that weekend at my local Borders. (Remember, with iTunes less than a year old, this was long before the days of Soundcloud and Spotify.) For the next six weeks, ‘Where Is The Love?’ remained unrivaled on the UK Billboard Chart. Over the same period, the band went on a non-stop publicity spree for their latest album, Elephunk, and I became familiar with all The Black Eyed Peas members – or their stage names at least. * As the group’s charismatic, side-cap-wearing frontman, I found it hard not to like will.i.am, who grew up in Boyle Heights – a housing project in eastern Los Angeles. As a white, middle-class, 11-year-old, however, it was hard for me back then to grasp how truly tough life had been for will.i.am before he found – finally – fame. 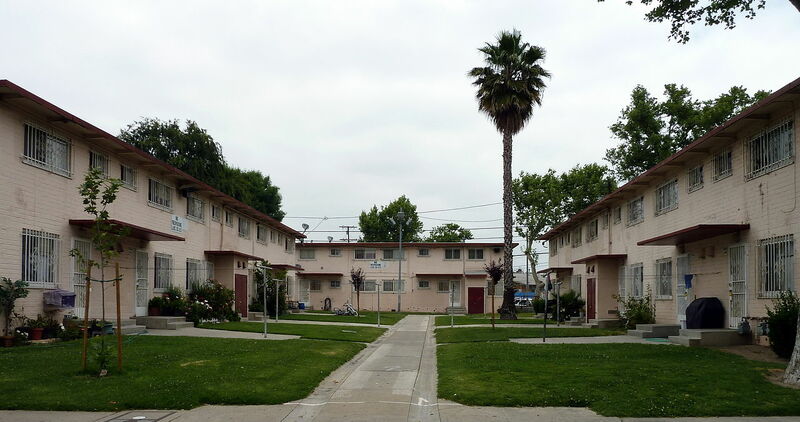 Ramona Gardens, Boyle Heights. Credit: tedder/Wikimedia. In the ghetto, ghetto, ghetto. Judging from the opening line, it almost feels like will.i.am obsessed over fame. It was his chosen path – perhaps his only real one – to escape his family’s poverty, which forced him to sleep on a floor-bound mattress during his adolescence. At the same time, as the second line shows, he feels guilty at having such high-aimed ambitions for himself. Understandably, although it would surely have cost him his career, a part of will.i.am may have wanted to remain forever in Boyle Heights. However, as aple.de.ap (real name Alan Lindo) says about his boyhood friend: “He almost had no choice but to make it [in the music industry]. That drive of providing for your family kept us going [when we started The Black Eyed Peas].” Paradoxically, then, one of the reasons for why will.i.am may have wanted to stay in Boyle Heights is one of the very same for why he first left. Now living in a Spanish-style villa in Los Feliz, an affluent area of Los Angeles, will.i.am has certainly ‘made it.’ From its back garden, complete with basketball court and outdoor projector screen, the villa looks down towards the Boyle Heights housing projects: a constant reminder of just how far he has come since he and aple.de.ap formed The Black Eyed Peas in 1995. But while he has moved to the other side of the city, that is not to suggest that will.i.am now distances himself from Boyle Heights – quite the opposite, in fact. As Joanna Lumley observes in the BBC One documentary: “Will stays connected to where he grew up.” Last year, for example, he donated computers to one of the local libraries to develop its young users’ technological skills. Through his i.am.angel foundation, he has also established i.am College Track, a philanthropic scheme that helps a number of Boyle Heights students to gain a much-coveted college education. Giving back to his old community, as Lumley notes, is will.i.am’s way of showing his gratitude. At the same time, though, as the chorus to ‘Ghetto, Ghetto’ seems to suggest, it may also be an effort to rid himself of the guilt he felt – and may still feel today – for originally wanting to leave Boyle Heights. Of course, in will.i.am’s defense, there are modern-day musicians who make far worse pop music than him. (Nicky Minaj’s ‘Anaconda,’ to name one, may well be the worst pop songs ever made.) Equally, like most money-lovers, there are some musicians who only seem to care about building up a property portfolio of ten-bedroomed mansions. (Miss Minaj springs to mind again, actually.) But will.i.am is different – or at least he seems to be so. He may be materialistic, evident through his fashion interests, but he is also conscious of such issues as poverty, education and global warming. As ‘Yes We Can’ demonstrates, he is a musician who can instigate change, both in our society and in our own outlooks on it. As I said, though I know it sounds cliché, ‘Where Is the Love?’ had a genuine impact on my life. After hearing the song, I wanted to ask my own mother: ‘What’s wrong with the world, Mama?’ (That song, interestingly, is still his most commercially and critically successful song.) Whether to Barack Obama, the United States of America or to people like me elsewhere, ‘Where Is The Love?’ and ‘Yes We Can’ made a difference: they communicated an idea – a message – that subsequently instigated an ‘awakening,’ to borrow will.i.am’s own phrase. If I were will.i.am, I would certainly want to be remembered for that sort of music. At the same time, I would also want the likes of ‘Check It Out’ to be quickly, and forever, forgotten. P.S. This song, written by apple.de.ap about his native Indonesia, should never be forgotten. *The Black Eyed Peas’ stage names: will.i.am, Fergie, aple.de.ap and Taboo.